Image credits: Oregon State University. Sugarcane is native to South and Southeast Asia. The inhabitants of those regions have been producing it since ancient times. 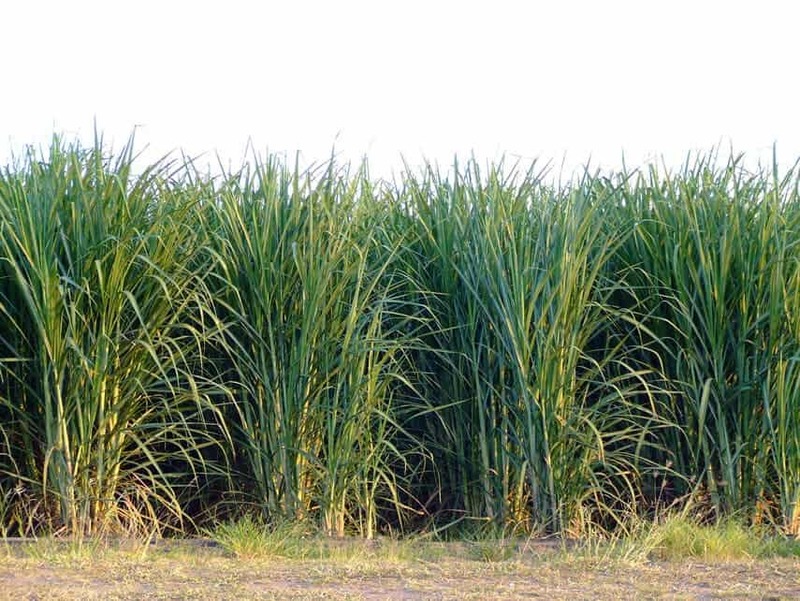 Sugarcane was first brought to Europe in the 1st century CE but it was presented as a medicine. Sugar gained importance as the Indians figured out how to crystallize the sugarcane juice in the 5th century CE. Then it was much easier to store and more versatile to use. Sugar was called khanda in the local Indian language, which is the source of the word candy. The Chinese learned about sugar refining from the Indians and created its first plantations in the 7th century. The technology then came to Europe where sugar was imported and refined. 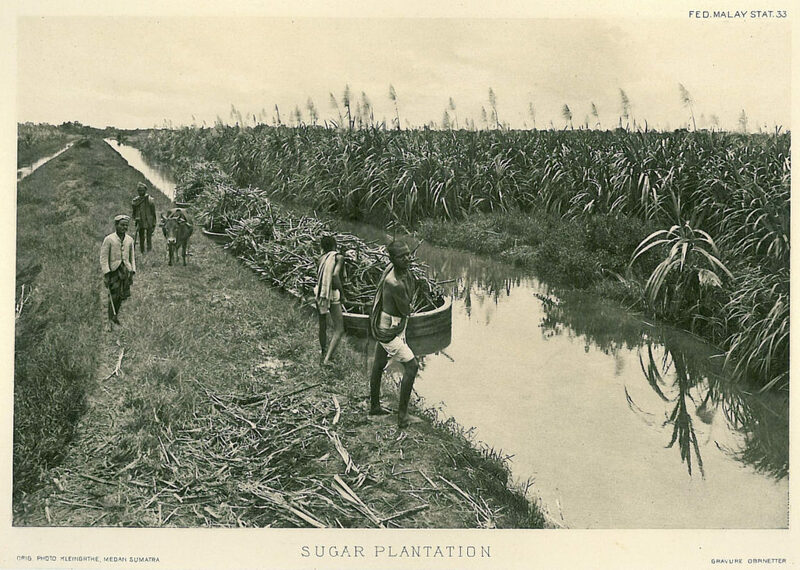 Sugar plantation in Indonesia circa 1900. Image credits: Wikimedia commons. Christopher Columbus brought sugarcane to the Caribbean, which turned out to have perfect growing conditions for the plant. Many plantations were established in Central and South America. Slave labour was in high demand to work these plantations. Because of this, sugar was cheap enough for most Europeans to be able to buy it. Sugar changed from being a luxury to a necessity and fueled the colonization of the tropical islands. In the early 19th century, Europe was consumed by war and mainland Europe was blockaded from the ocean. Therefore, Europeans had to find a new alternative to continue to enjoy the sugar they had grown fond of. They discovered that the sugar beet has a high sugar content that can be extracted, and mainland Europe switched their main sugar source from cane to beets. Sugar cane requires tropical climates, while sugar beets can be grown in more temperate areas making it possible to grow in the temperate European climate. Europe has gotten its sugar mostly from sugar beets from that period on. The industrialized process of sugar making has kept sugar prices low and made it an integral ingredient in any kitchen cupboard. Industrially, high fructose corn syrup is often used in food products as a replacement for sugar because it is sweeter and cheaper to produce. Starch is extracted from milled corn and enzymes are added to convert the sugars to fructose. However, table sugar is nonetheless in high demand. Sucrose is the typical white sugar that you have in the house. It is harvested from sugar beets and sugar cane. Other plants contain it as well, in addition to glucose and fructose, but not in quantities sufficient for harvest. One molecule of sucrose is created from the combination of one molecule each of glucose and fructose. It’s not the only sugar; lactose, maltose, fructose, galactose, and glucose are other types. The sugar beet, a cultivated variety of Beta vulgaris, is a root vegetable that contains a large proportion of sugar. It can be grown in a temperate climate. When brought to the sugar processing plant, the beets are first washed and then sliced. Water is added to create a sugary juice. The sugar is extracted through diffusion. Milk of lime (diluted calcium hydroxide) is added to the juice and carbon dioxide-enriched gas is used to carbonate the juice several times to purify it. Carbonatation causes impurities in the sugar to form a solid and that can then be easily removed. The resulting syrup is boiled to evaporate out water. It is then cooled and seeded with sugar crystals. The crystallized sugar is separated out in a centrifuge and then is dried. It takes 7 sugar beets to make a kilogram of sugar. 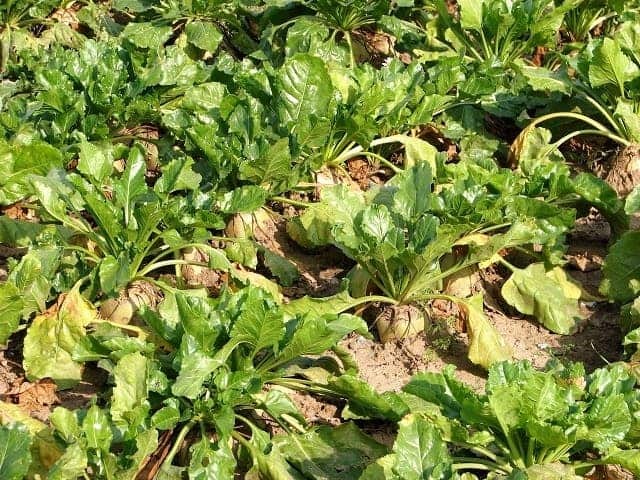 Sugar beets in the field. Image credits: Geograph. Sugar cane needs to be grown in a tropical climate without any frost. Around 78 million tons of sugarcane are harvested annually. After being harvested, the sugar cane is brought to a sugar mill. The stalks are pulverized and water is added. Impurities are removed with lime and the juice is heated to destroy enzymes. The water is removed in a series of evaporation steps to make the syrup thick. It is seeded with sugar crystals and then dried. The resulting raw sugar crystals are slightly brown and sticky. Molasses is created as a byproduct of sugar production and sugar cane molasses is usually used over sugar beet molasses because of its taste. Molasses added to refined sugar makes it into brown sugar. 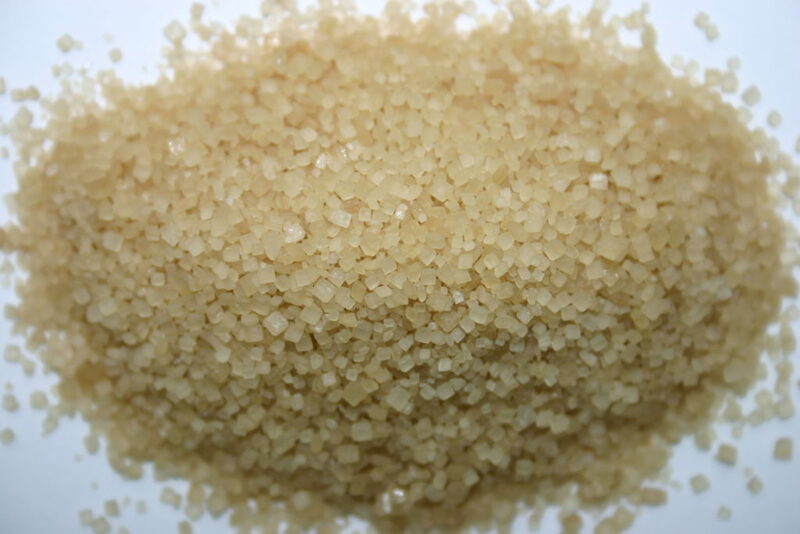 Raw sugar still contains some molasses in the crystals, which has not been refined out. That is the difference between brown and raw sugar; for brown sugar, the molasses is just added to the refined sugar. Sugar cane growing. Image credits: Phil. Raw sugar is 97.5% sucrose and also contains glucose, fructose, inorganic ash, gums, amino acids, and color. It is further purified through several steps to make white, refined sugar. The raw sugar goes through an affination process and surface impurities are dissolved off by putting the sugar crystals in a concentrated syrup that removes the sticky brown coating of the raw sugar. The sugar is carbonated by adding the base calcium hydroxide to neutralize the acidic sap. Activated carbon removes the brown color. The next step is to crystallize the sugar by boiling the syrup and seeding it with sugar crystals, then centrifuging the liquid off. Raw sugar contains impurities. Image credits: Fritzs. 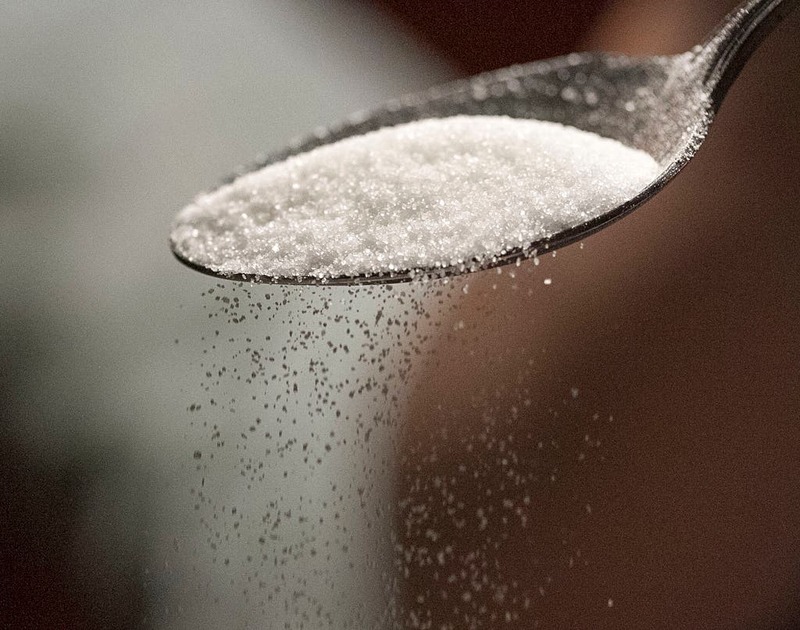 Sugar has gone from being a commodity to a necessity in a short span of time. Historically, sugar production is closely tied to colonization and slavery. Now, industrialization keeps sugar accessible. Sugar undergoes several processing and purification steps to make it into the crystallized and refined sugar that ends up in your coffee.